Take margaritas to a new level with these frozen treats. 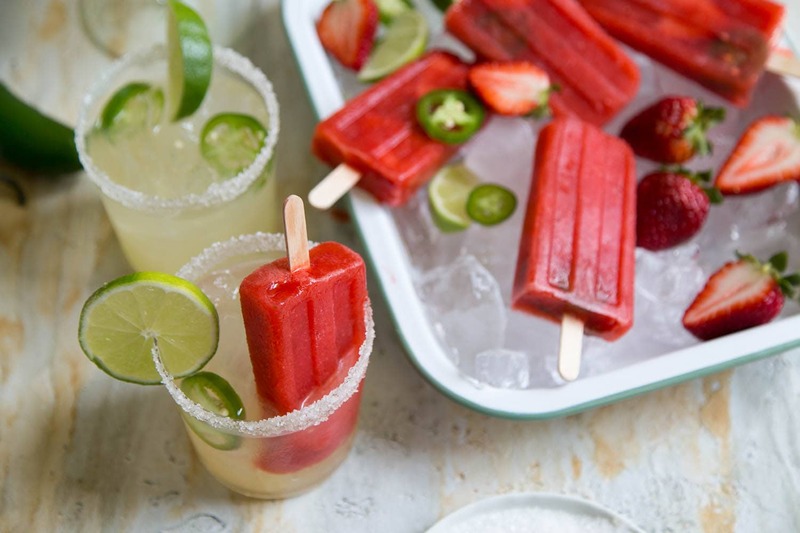 These strawberry jalapeño margarita popsicles are sweet, spicy, and boozy! Summer is coming. It’s time to get your freezer stocked and ready. To battle the heat you are going to need: no churn espresso dulce de leche ice cream, halo-halo (Filipino shaved ice sundae), and popsicles… lots and lots of popsicles. In my opinion, the best kind of popsicles are the ones that serve two purposes: 1) cool you down and 2) booze you up! 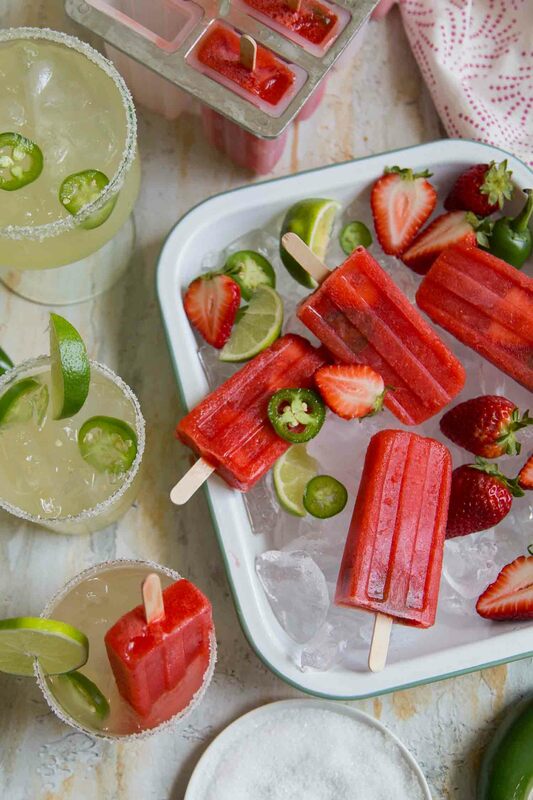 These strawberry jalapeño margarita popsicles are THOSE popsicles. 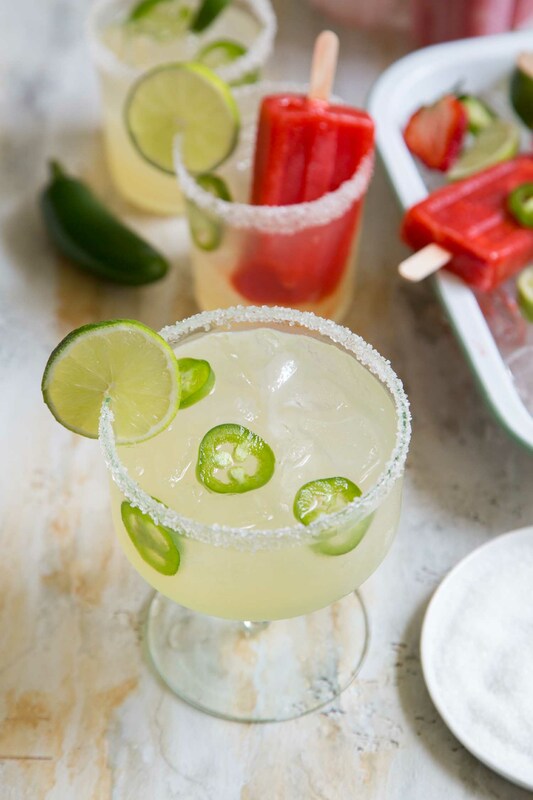 These frozen pops are made with tequila, fresh strawberries, lemon and lime juice, and sweetened with jalapeño infused simple syrup. 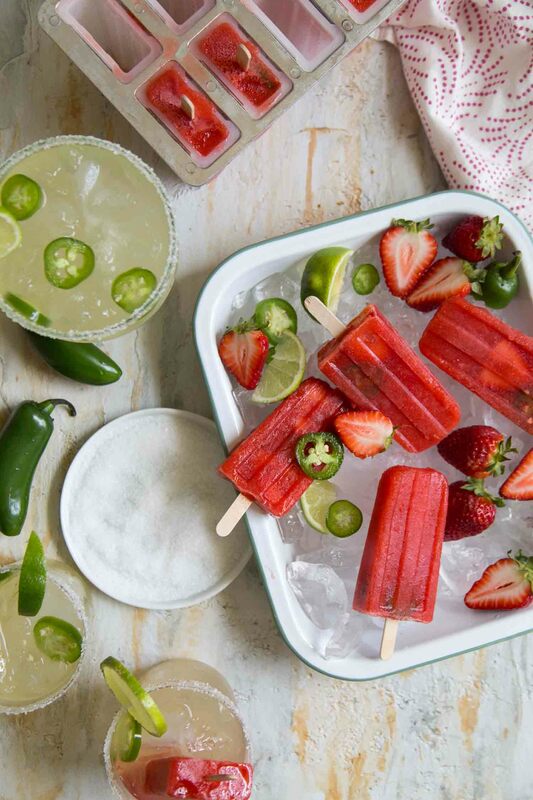 Short answer: these tequila based ice pops will not freeze solid. Long answer: let’s dig into a little chemistry. Water freezes at 32 degrees F (0 degrees C). The higher the proof of alcohol or spirit, the lower the freezing point of said liquid. It’s popular to store vodka in the freezer to keep it chilled. An 80 proof vodka freezes at -16.5 degrees F (-27 degrees C). FDA advises that your home freezer should be 0 degrees F (-18 degrees C). Unless you have a super blast freezer, the vodka will not freeze. Tequila ranges from 62 to 110 proof. It will get cold in the freezer, but it won’t freeze solid, either. What happens to freezing temperatures when you add sugar and other liquids to alcohol? Like alcohol, sugar also lowers freezing point of water. There is a mixture of sugar and water from the strawberries, as well as sugar and water from the simple syrup. The amount of sugar in this recipe makes the resulting texture from the popsicle a bit creamy and slushy. Too little sugar and the popsicle will be frozen rock solid. Too much sugar and the popsicle will never solidify. Is a popsicle mold necessary? Can I use something else? Ice Cube Tray: pour the mixture into an ice cube tray and freeze. Once solid, process the cubes in a blender to make a slushy, frozen strawberry jalapeño margarita! Paper Cups: pour mixture into the paper cups, cover with foil, and pop a wooden stick in it. Freeze and then peel off the paper and eat. Freezer Safe Containers: use a freezer safe container such a shallow plastic storage container. Fill the container, cover, and freeze. Serve the frozen margarita like a granita, or allow the frozen margarita to soften slightly and then scoop like sorbet. It’s Margarita Week! Kate of Hola Jalapeño put together this wonderful celebration of all things margarita inspired. From cocktails and mocktails to savory foods and desserts, check out the hashtag #MargaritaWeek all over social media for recipes and more! In a blender, combine tequila, strawberries, jalapeño simple syrup, lime juice, lemon juice, and lime zest. Process until smooth. If desired, add more jalapeño simple syrup according to your taste preferences. 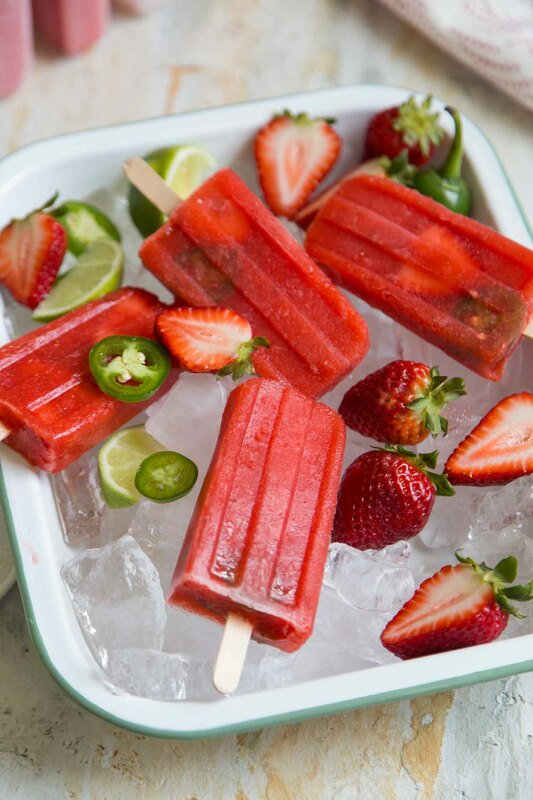 Add a few strawberry slices and jalapeño slices in popsicle mold cavities. Pour blended mixture into popsicle molds. Insert wooden popsicle sticks. Freeze for at least 6 hours until popsicles are solid. To make jalapeño simple syrup: bring sugar and water to a boil. Once sugar has dissolved, remove from heat and add sliced jalapeño. Allow jalapeño to steep until mixture has cooled to room temperature. Strain out jalapeño. Keep simple syrup chilled in the fridge until ready to use. Will keep for several weeks. It's best to freeze popsicles overnight to ensure they are solid. These popsicles will not completely freeze due to the amount of alcohol and sugar in the recipe. The resulting popsicles will have a creamy, slushy texture. 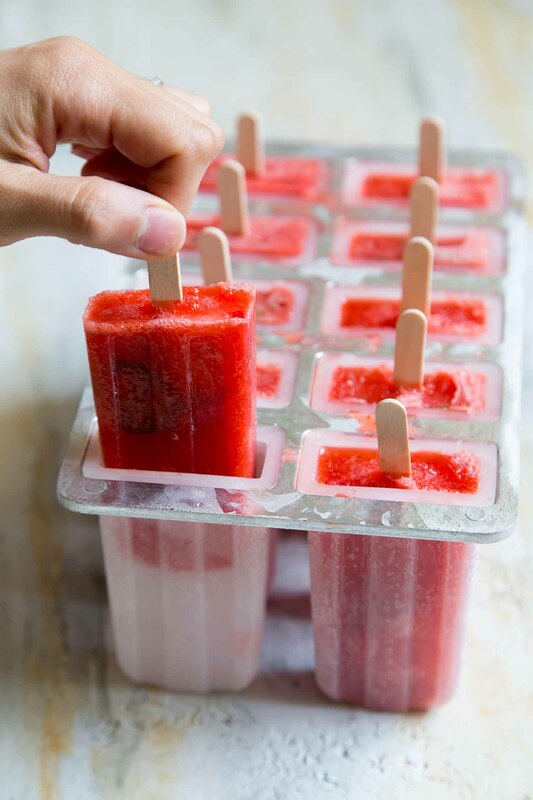 If you don't have popsicle molds, you can also freeze these into ice cubes and blend into a frozen drink. These sound so delightful–a great addition to any Cinco de Mayo party! I love when typical kid-friendly treats get an upgrade to an adult treat! These sound amazing!! Should’ve made these for Cinco de Mayo, ha!